Colour is highly variable from yellowish brown, dirty white to almost black. Legs orange in males and usually yellow in females, with reddish-brown ring at the end of each leg segment. 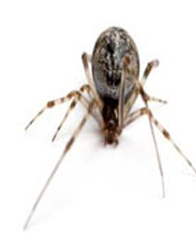 House spiders prefer humid conditions outdoors near the home. They avoid sunlight, rain, and wind during the day and feed at dusk. Colouring is tan to dark brown. 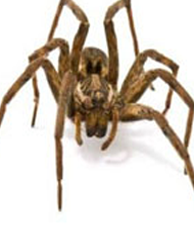 Brown Recluse spiders are typically found in the Southern United States. 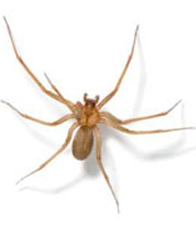 There is no confirmed documentation of Brown Recluse spiders having become established anywhere in Canada. brown with paler yellow to dark brown stripes. Very large spider with long, spiny legs and claws. Wolf spiders are mainly found outdoors and are nocturnal hunters. Their webs are mainly found under stones, timber, wood piles, and low, ground-level decks.